A Washington University study has shown that more than a dozen north St. Louis neighborhoods have high rates of childhood asthma. The study, soon to be published in the journal Social Science & Medicine, identified five ZIP codes in St. Louis that are hot spots for childhood asthma, meaning that they contain clusters for the city's highest rates of the illness. The report used census and health data from multiple government agencies. The rate of hospitalizations for childhood asthma for those ZIP codes, which include downtown St. Louis, Baden and North Riverfront neighborhoods, are five times that of two ZIP codes in southwest St. Louis, which have the lowest presence of the illness. The hot spots highlighted in the paper are home to mostly black and low-income residents. Health care resources are more scarce in those areas than in other parts of the city, said Kelly Harris, a postdoctoral researcher at Washington University’s Child Health and Education Laboratory. 9-year-old Cenya Davis puffs on her inhaler in this 2018 file photo. The study notes a vast geographic disparity in pediatricians and doctors that specialize in allergy or immunology. Less than a percent of them work in the five ZIP codes with the highest childhood asthma rates, and 81 percent work in children's hospitals that are located in areas where there are low rates of the illness. While the study did not analyze transportation systems, it’s something worth looking into next, Harris said. City health officials have been aware of the lack of access to health care services in some neighborhoods. 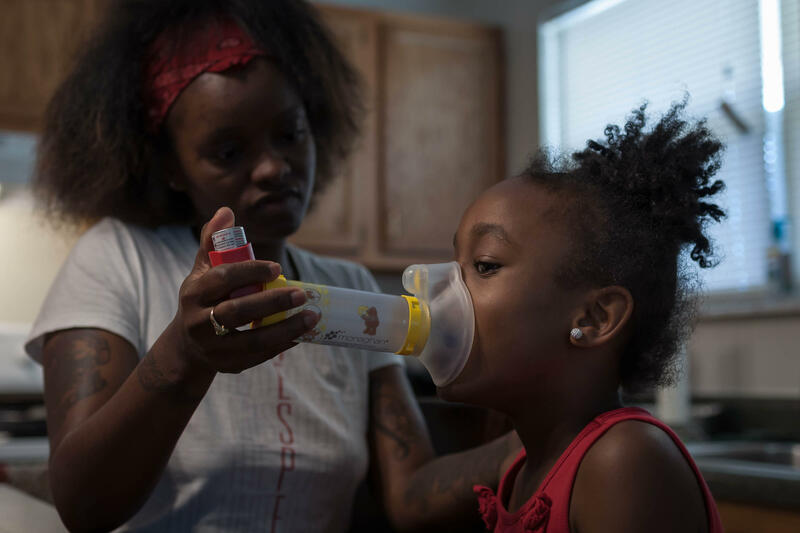 The St. Louis Department of Health has tried to remedy that by having health care practitioners visit the homes of people who suffer from asthma, said Lakiska Stephenson, a public health program representative for the city’s department. The report also describes numerous factors that could potentially help explain why childhood asthma rates are so high in those areas. There’s more violent crime, public housing and deteriorating buildings in those areas, Harris said. Harris’ next steps involve looking into how childhood asthma could be affecting academic performance among children in St. Louis. “Asthma illnesses keep kids out of the classroom, which impacts their academic performance, their ability to connect to the school environment, in some cases, their motivation,” she said. St. Louis, overall, has among the highest rates of asthma in the country. Asthma rates are also higher for black St. Louis residents than white residents, and they’re rising for black children and adults, according to 2015 data from the city department of health. Audrey Collins’ two daughters were diagnosed with asthma as infants. When they had trouble breathing, she would use a nebulizer machine with a tiny attachment for their faces. “And if it didn’t get better, I’d take her to the emergency room. And we were in there a lot,” Collins said, during a recent visit with her daughters to a mobile asthma clinic parked outside their pediatrician’s office in north St. Louis. Children who live with persistent asthma in childhood are at a higher risk of developing lung problems later in life, according to new findings from a national asthma study that began in the 1990s. A small number of patients even exhibited symptoms of chronic obstructive pulmonary disease, or COPD, in early adulthood.